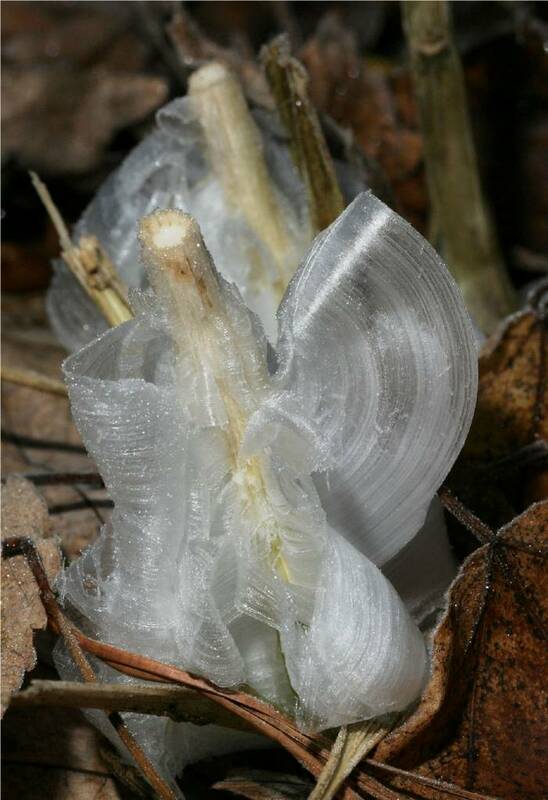 As the temperature gets to freezing or below the sap in the stem of the plants will expand. 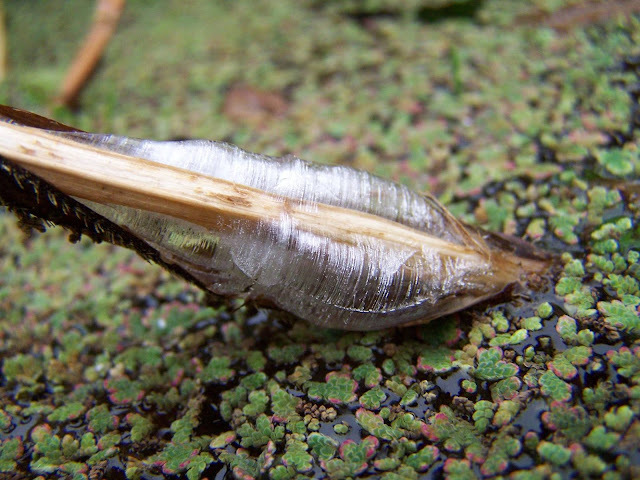 As it does so the outer layer of the stem comes under increasing pressure and microscopically thin cracks, known as linear fissures, begin to form. 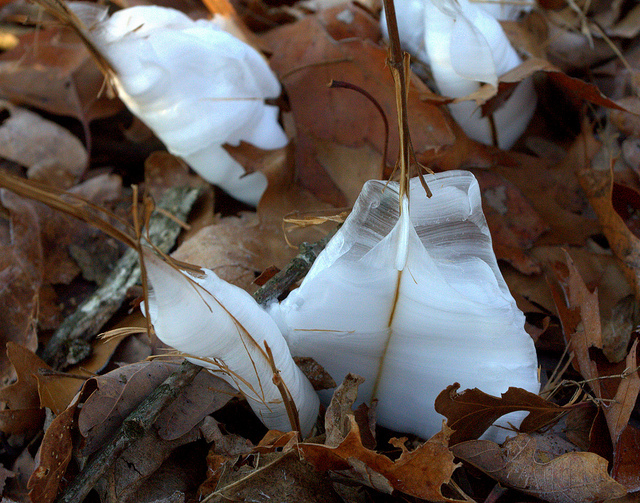 These will finally give way under the pressure of the sap and split open. 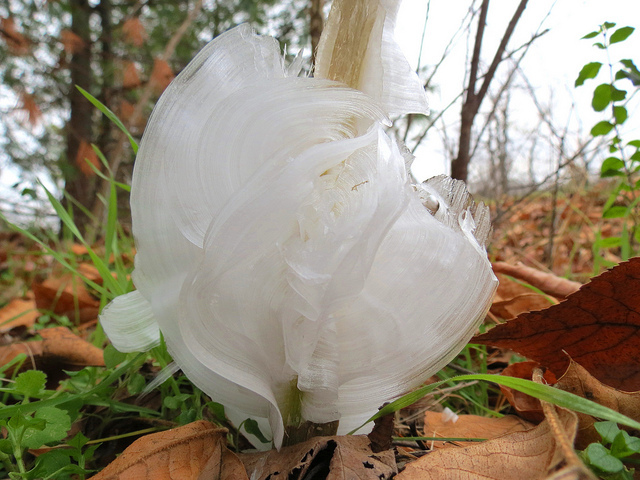 Water is continuously being drawn up the plant’s stem while the ground remains unfrozen. 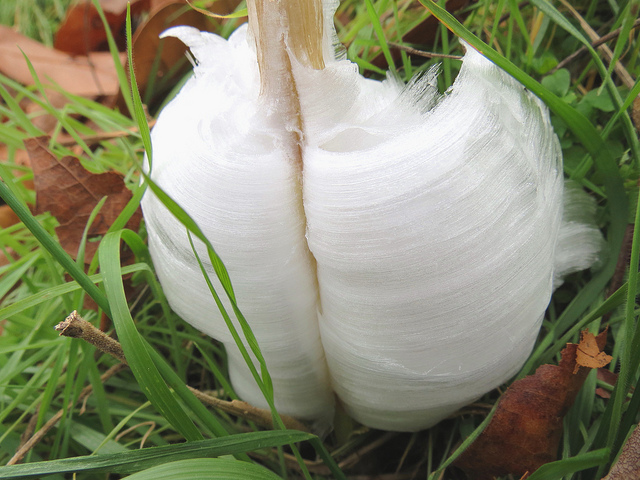 It travels up the plants external structural axis (stem!) and reaches the split or splits. 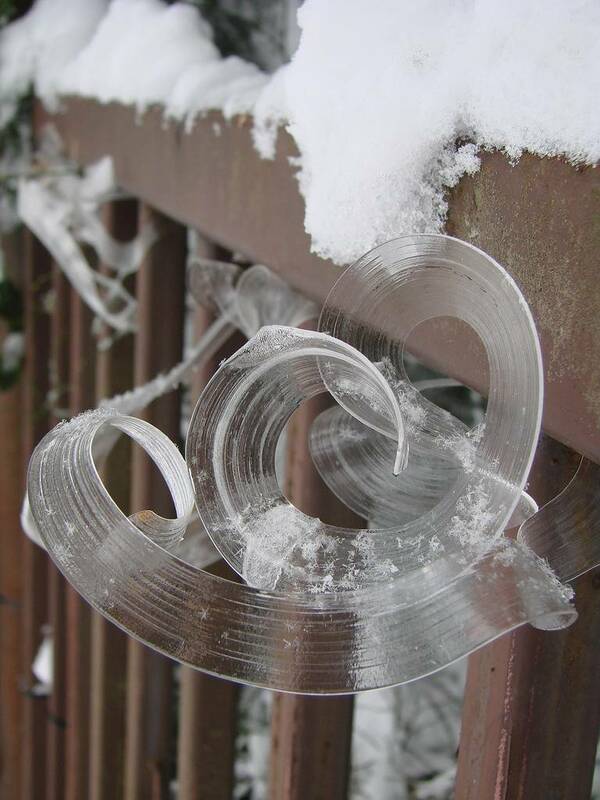 As it does so, it oozes slowly out and it freezes. Yet more water is coming behind it. 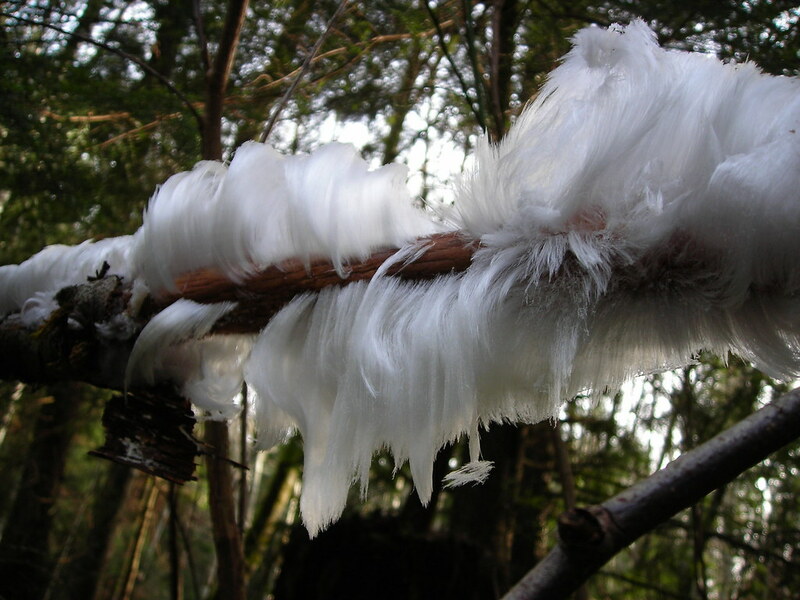 This new water reaches the cracks and it too freezes, pushing the previous slither of ice away from the stem. 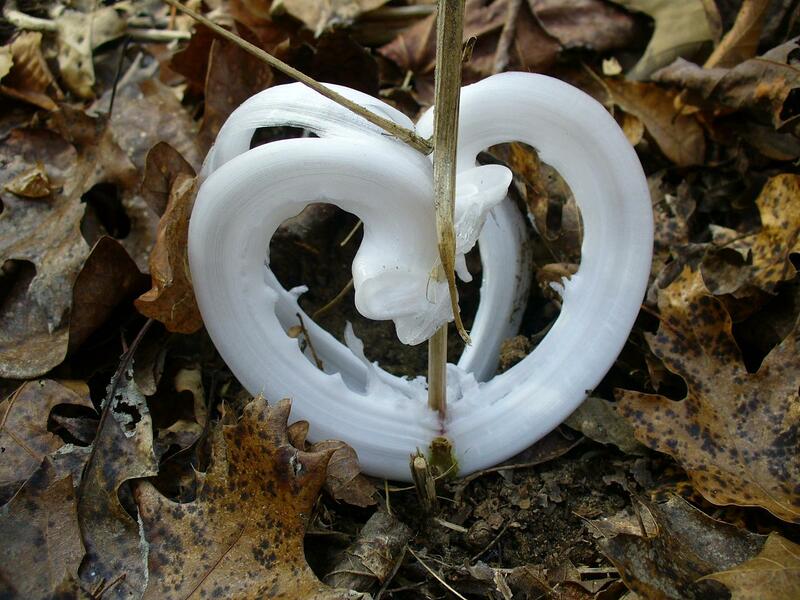 In this manner the amazing ‘petals’ that you see in these pictures are formed. 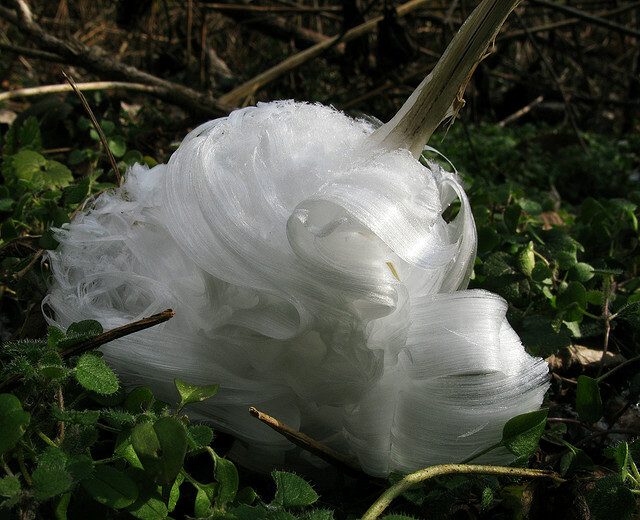 Incredibly, the frost flower effect can happen to wood even when it has been made in to a fence or a gate, as seen above. 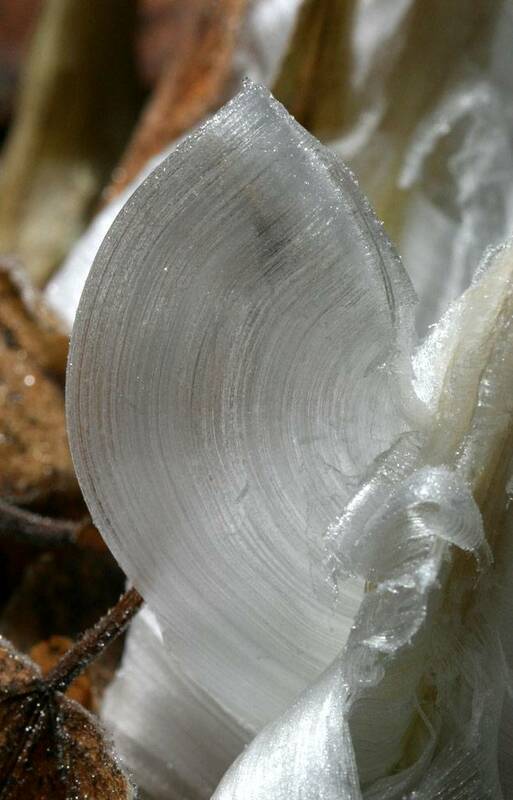 In this case the water is extruded through the pores in the wood rather than cracks. 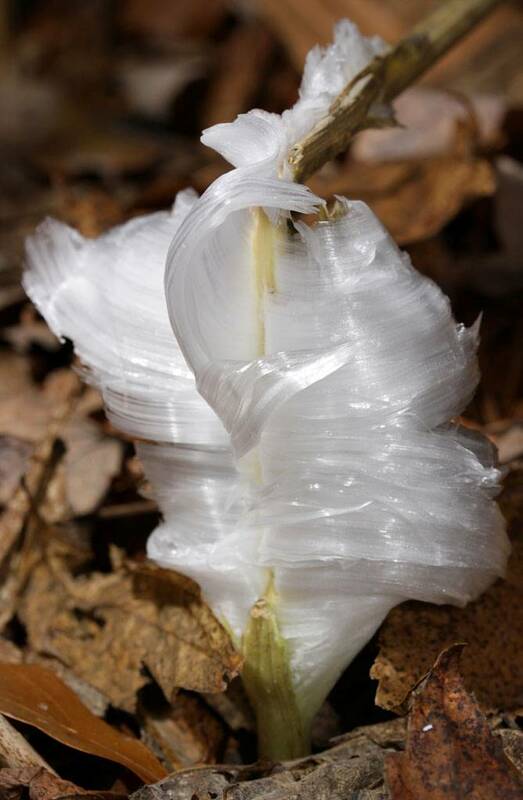 The frost flower has a number of other names: you may know them as frost castles, ice castles, ice blossoms, or even the very scientific sounding crystallofolia. 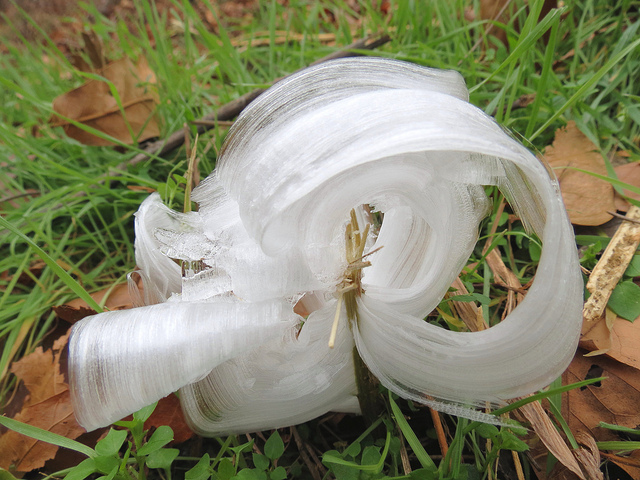 Yet the name is something of a misnomer: frost is created by water vapor. 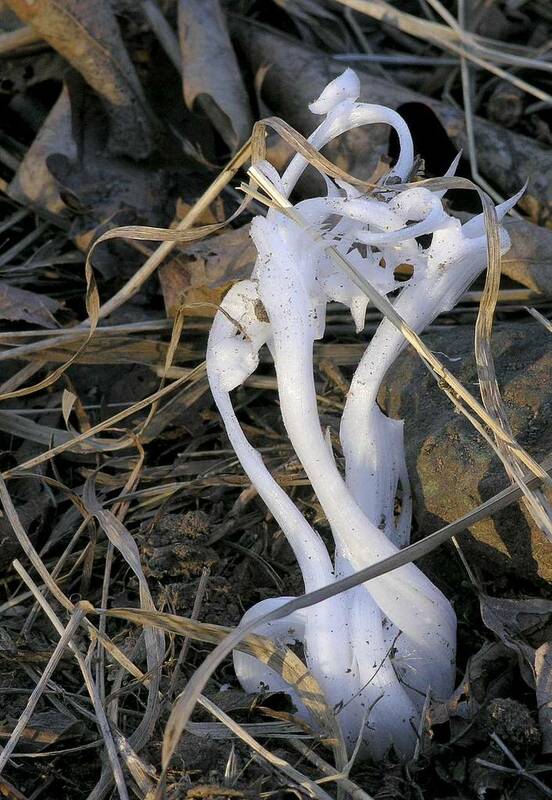 Frost flower, on the other hand, are formed from liquid water. 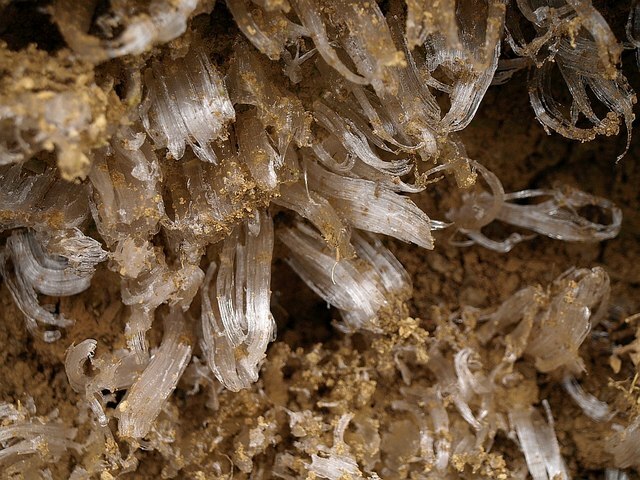 If you come across one – be careful! 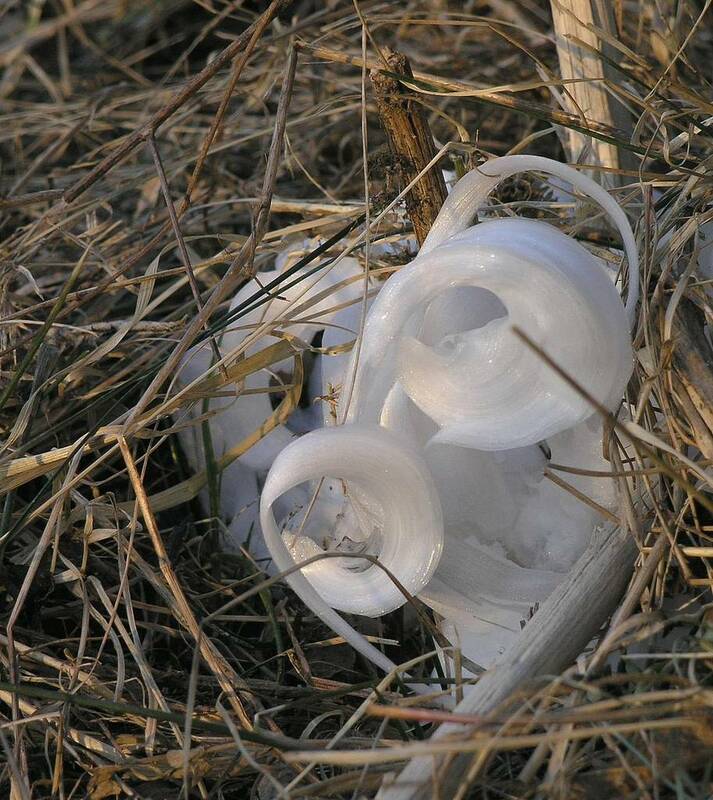 Rather than attempt to pick it up, if you have a camera or a phone with you take a picture instead. 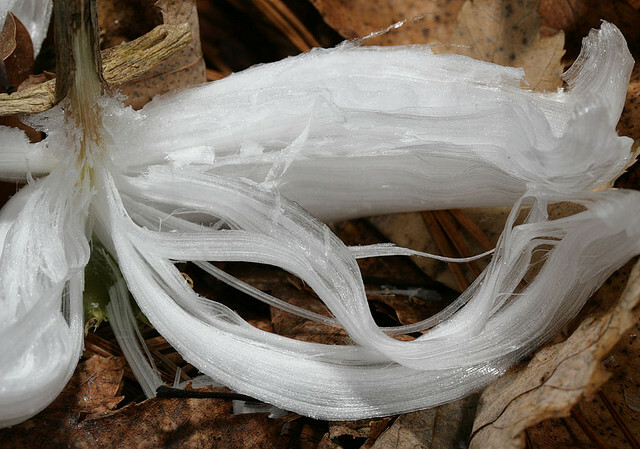 Frost flowers are incredibly delicate and will more often than not shatter when touched. 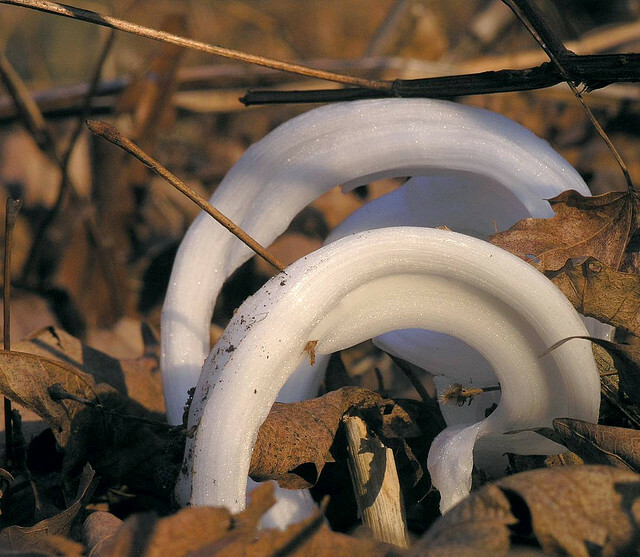 Not only that, as they are made of such thin sheets of ice, they will melt away as the sun rises higher in the sky. 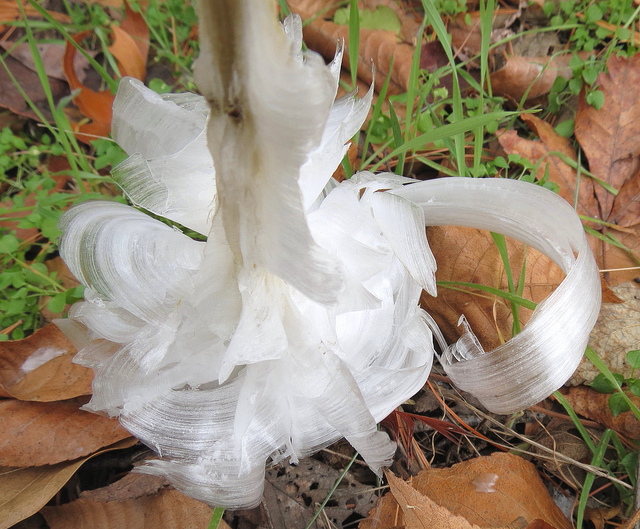 You may get frost flowers again the following day, but unless the conditions are just right the chances are your first glimpse may be your last.